You may already know the story of Captain Phillips, the heroic merchant mariner held captive by Somali pirates that tried to hijack his ship in 2009. But CAPTAIN PHILLIPS, the movie inspired by this incredible headline, isn't about watching what happened; it's about feeling it as it happened. From the moment the film begins, you feel a level of unease you're unable to shake. It's a tense, foreboding feeling--heightened by the film's pulsating score- that grips you intensely. For those first few minutes, like a ticking time bomb, you watch and wait for the action to happen. Director Paul Greengrass takes you through a routine day in the title character's chiseled life that escalates to a harrowing ordeal too remarkable to believe, even though it is based on a true story. 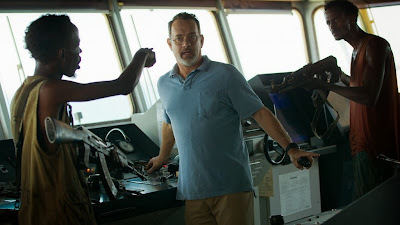 Tom Hanks plays Captain Phillips, a razor-sharp merchant mariner whose personality we learn through short, brisk dialogue carried through the entire film. His direct, no-nonsense demeanor is introduced early on in a brief--and inane--encounter with his wife, Andrea (Catherine Keener, who's in two small scenes in which any actress could have been cast), from whom he departs to set sail on a seemingly conventional cargo trip to Mombasa, Kenya. What makes this beginning interesting is that Greengrass juxtaposes it with a more acute conversation in Somali between several young men grappling to get in on a major payday. 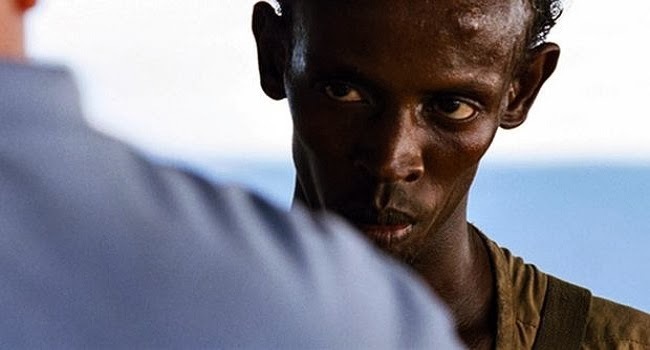 As Phillips delivers curt safety instructions to his 20 respectful crew men on board the Maersk Alabama, Muse (Barkhad Abdi) struggles to gain similar esteem in Somalia from the countless other men equally as desperate to prove themselves and earn their keep. Their next opportunity will come in the form of seizing a ship and robbing millions of dollars to bring back home. Greengrass' parallel motivation of the Somali pirates is the film's biggest strength--it provides a more rounded reflection of the events as they took place on both sides. While there is a clear protagonist and antagonist, this technique humanizes the villains and allows for underlying morality themes to surface. When Muse and his cohorts finally make their way on to the Alabama vessel, after several tense power struggles, you realize that Muse has much more at stake than money--he is also clamoring for validation from the men of his tribe. So when his plan goes horribly awry (at the expense of both his accomplices and the Alabama crewmen), he takes Phillips as hostage aboard the very lifeboat the captain gave him to escape. The two men (both fighting to retain control over their situations) commence an agonizing face-off between victim and captor that is much less about the physical control Muse has than the dominance he lacks. With a story like this that has two aligned point of views, you need two strong actors that can reflect tenacity in their perspective dire predicaments. It's fascinating to watch Hanks, who has defied film genres with more than 30 years of acting experience under his belt, present a man who relies on principle and morality crumble when faced with his own mortality. It is a testament of courage under fire in the most accessible way--from a man who stood for everything and was pushed off his pedestal by a man equally as determined to succeed. Abdi, in a career-making debut performance, is equally riveting to watch. He is completely immersed in the role and can act more in his eyes than some more famous actors today can do with their whole bodies. He's unflinching throughout all of Muse's quagmire, even when he has lost the match. To Muse, rising to this call of duty is a mandate; there are no options. It has nothing to do with overtaking Captain Phillips and his ship. In fact, in the one rare scene where he lets his guard down, he says, "I love America." It's a soul-splitting moment that defines his character. 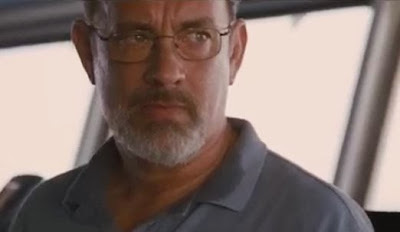 While CAPTAIN PHILLIPS is punctuated by its two male leads, Greengrass' absorbent direction and a commensurate screenplay by Billy Ray (a truly underrated writer in the business) complete this high-stakes, visceral drama that allows the audience to experience the myriad emotions at the same time as the characters. It captures what is truly remarkable about the human spirit in times of peril. I thought this movie was brilliantly done, too. So wrenching. Great review! Good review Candice. Hanks' best performance in, I don't know, I'd say about a decade or so. But nonetheless, he's great, as well as the rest of the movie is, making it one of my favorites of the year.